Last weekend we went to Beypazar?, a small village an hour and a half by bus from Ankara. Located on the old “Istanbul to Baghdad route,” Beypazar? has been inhabitated by various tribes and peoples, including the Seljuks, who left behind a 12C mosque, and the Ottomans, whose “konak” houses dot the town’s hillside. Beypazar? is known for its silver, especially filigree work, and is responsible for 60% of Turkey’s carrot (havuç) production. Beypazar?, whose name translates roughly as “gentleman’s market,” struck me as a typical Anatolian village. Off the hot, dusty (but tidy) cobbled streets, old men huddled, drank tea, and played backgammon. A majority of the native women covered their hair with broad, patterned silk scarves that fell to about waist-length. Meanwhile, during the festival, young men wearing finger cymbals danced two-by-two to music that was part Turkish flute (ney) and part techno drumbeat. Near the town’s Ottoman Müze, what appeared to be a high school woodwind quartet played the requisite “Rondo alla Turca” from Mozart’s Sonata No. 11. While more cosmopolitan parts of Turkey, such as Istanbul, like to play up their historical and geographical connection to mainland Europe, Anatolia looks to its pan-Turkish heritage. And, Beypazar? being the Turkish heartland, it wasn’t a surprise to find a large mosaic map in one town square which highlighted the “Turkic” areas of the world: Azerbaijan, Kyrgyzstan, Bulgaristan (Bulgaria), Turkmenistan, Uighur Mongolia, etc. 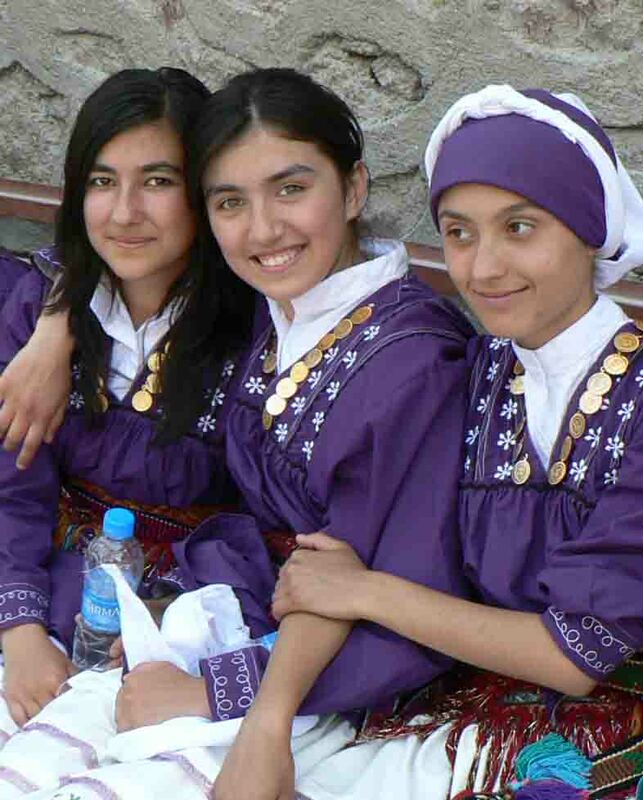 Groups of beautiful, dark-haired, light-eyed girls wore the traditional costumes from these regions. But back to the food. Those famous carrots were a central theme at the Beypazar? Festival. Multiple vendors offered bottles of fresh carrot juice, while others sold carrot helva. Further along, there were stands overflowing with dried fruits (including incredibly sweet sun-dried tomatoes) and nuts, packages of grape leaf dolmas and walnut baklava, and ayran, a yogurt drink not unlike a lassi. We stopped at a döner kebap stand and later watched village women rolling out and cooking gözleme (a bit like a pancake) filled with a hard, white cheese (beyaz peynir) and parsley (maydonoz). Beypazar?’s classic dish, which we didn’t get a chance to taste, is a casserole of lamb, rice, eggplant and earthy, easily attainable ingredients. The village also makes good use of a copious amount of walnuts by preserving them in a “walnut sausage,” a confection that looks exactly like the meat product but is flavored with nuts and sweetened with grape jelly. In addition to ayran and carrot juice, Beypazar? residents wash down their meals with mineral waters from the Inözü Valley. Only an hour and a half from Ankara, Beypazar? is probably a sleepy town for 364 days per year. But it still merits a visit for its lovely Ottoman houses, gorgeous silver, and honest food. And even though the village is not quite on the tourist route, it has a surprisingly sophisticated, English-language website, helpful for planning a daytrip. I wish to visit the carrot festival in Beypazari and was looking for more information on the bus service from Ankara. Do you have any more details. I hope you can help. I am wishing to visit Beypazari in June to see the Carrot Festival. I would arrive in Ankara from the UK and then either stay there and go by bus/rain and return the same day. 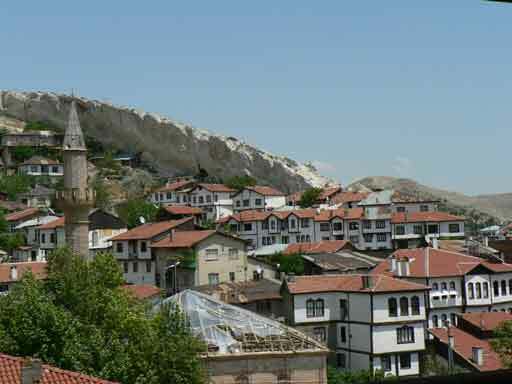 Or travel to Beypazari, stay a couple of nights and return to Ankara to fly back to UK. So I am trying to find out if there are convenient and regular bus or train services from Ankara and whether it could be possible to do a trip in a day. I run the World Carrot Museum at http://www.carrotmuseum.com and visit all carrot festivals around the world. Oh dear. I am afraid you commented before and I failed to reply. There definitely IS regular daily bus service to Beypazar?, but I do not currently know the schedule. Luckily, the carrot festival is not until June. So I can consult some friends about the timings and where to catch the bus. I recall catching the bus right outside of Anka Mall when I took the trip, but that was early on in my stay. I would advise at this time that you plan to stay in Ankara. Beypazar? is easily done as a day trip and Ankara has some good hotels and some sights to see. It’s John again! Do you know the date for the June 2014 Carrot Festival? the beypazari web site has a dead email address.